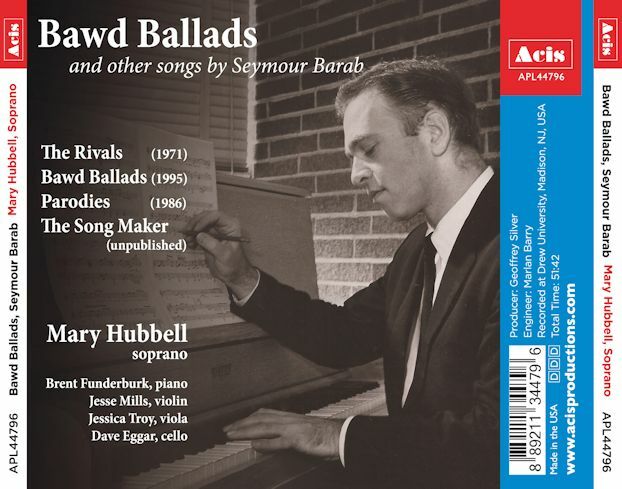 Seymour Barab Interview with Bruce Duffie . . . . . .
Seymour Barab (January 9, 1921 – June 28, 2014) was an American composer of opera, songs and instrumental and chamber music, as well as a cellist, organist and pianist. He was best known for his fairy tale operas for young audiences, such as Chanticleer and Little Red Riding Hood. He was a longtime member of the Philip Glass Ensemble. Both of Barab's parents were Polish immigrants, who emigrated separately and met in the United States. The family had little money, but Barab's parents considered culture important, and he was given piano lessons, from an early age, at first with his aunt, Gertrude Yablunky. When Barab was thirteen, he started his first musical job as an organist for a church of spiritual healing that his aunt attended. Barab began to study the cello when he entered Lane Tech High School in Chicago in 1935. Lane Tech offered a four-year music program, and required each student to study an orchestral instrument. He later said of his choice: "They happened to need cellos. If they had needed a French horn player, I’d be a French horn player". Barab also took lessons with the high school orchestra conductor. While at Lane Tech Barab became friends with Ben Weber and George Perle, both of whom would go on to become well known contemporary composers. Together, in 1938, the three founded the New Music Group of Chicago presenting contemporary 20th-century music. They programmed their own compositions in addition to works by other contemporary composers. Most notably, they gave the Chicago premier of Bela Bartók's First String Quartet. Barab became a lifelong champion of contemporary music. Barab later said of Weber and Perle: "I learned from them. I learned all about music, really. It gave me something to be dedicated to, unplayed music by talented composers. Of course, we were all very young then. I just decided that this was what I wanted to do, rather than play the concerto repertoire and the sonata repertoire." After finishing high school, Barab's first professional position was as a cellist in the Indianapolis Symphony Orchestra. 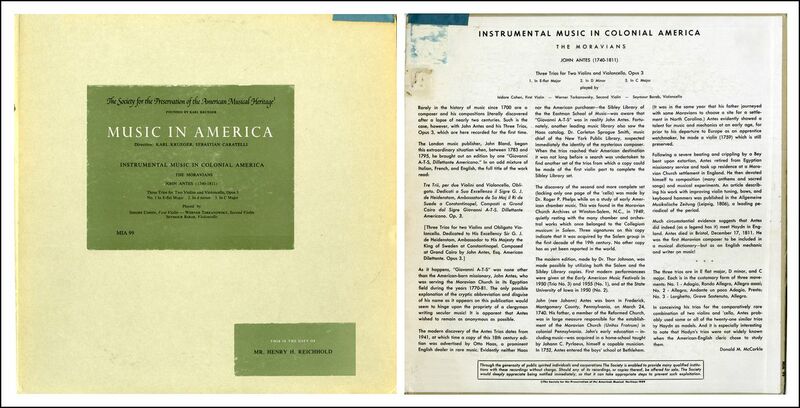 This was followed by positions with orchestras in other cities around the United States including Cleveland, Philadelphia, San Francisco and Portland, Oregon. and with The Chicago Civic Orchestra and the Brooklyn Philharmonic. Barab later recalled: "I went from one [orchestra] to the other, which is hard to imagine these days. … You stayed in one, one season. Then, you moved up to a better orchestra." During World War II, Barab joined the Navy as musician, and was stationed in the Philadelphia Navy Yard where he learned to play clarinet and played in the military band. According to Barab, the main reason he was stationed in Philadelphia was because Eugene Ormandy recruited him as a cellist so there would be a string orchestra "to play for the Officer’s Lunch". 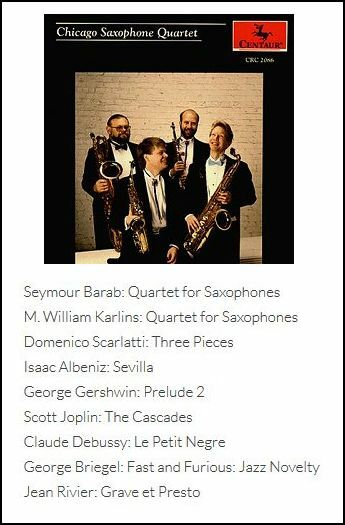 During this time, Barab played with the Philadelphia Orchestra and studied cello with Gregor Piatigorsky, who was teaching at Curtis Institute of Music. Toward the end of the war, Barab married Shirley Gabis, but the marriage ended in an annulment five years later. Barab and his wife moved to New York City where he played for both the American Broadcasting Company and the Columbia Broadcasting System. He also played in the Galimir String Quartet, and helped to found the New Music Quartet of New York. With Noah Greenberg, he later founded the New York Pro Musica Antiqua in which Barab played viola da gamba. Barab began composing during a year that he spent in Paris, France, from 1950 to1951 on the G.I. Bill. Barab also suggested that his relationship with a singer, Pat Neway, and the upright piano in his rented Parisian apartment, that led to the start of his composition in France, saying, "I would play and she would sing. I would act like sort of a coach. Gradually, I began to get interested in writing for the voice." There, he worked with Rene Liebowitz as a recording producer, and together they recorded operas and symphonies. When asked what drew him to composition, Barab answered: "[E]ventually I came to think that [composers] had a much better life than I had. They could do what they did anywhere, but I was kinda stuck with a job or with commitments, that sort of thing. I've always been interested in fooling around writing music". Barab wrote strictly songs when he was in Paris, but he soon began to venture into other genres. Upon his return from Paris, Barab was offered a position as an assistant professor of cello at Black Mountain College in North Carolina. There he met his second wife, Mary Ann, with whom he had two children, Miriam and Jesse, and he also completed one of his first songs cycles, A Child's Garden of Verses. 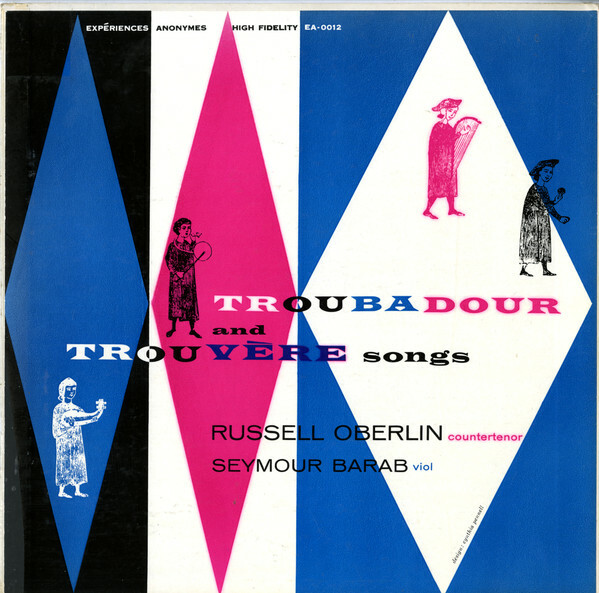 The recording of this song cycle, sung by Russell Oberlin, sold well and led to Barab receiving a job as a professor of composition at Rutgers University. He took another job at the New England Conservatory of Music starting the Composer's Quartet. He recalled: "Our idea then was to do nothing but contemporary music, and especially contemporary music that nobody else would play. I loved doing things that just aren't going to be done. That gave me a real purpose in life." Two more of his songs cycles were published before the end of the 1950s that continued to further his reputation as a composer of tonal music, namely Four Songs and Songs of Perfect Propriety. In the mid-1950s, Barab began to work on opera composition, collaborating with librettist M. C. Richards on a one-act piece that would eventually become his first opera, Chanticleer. It was premiered in Aspen, Colorado, on August 4, 1956, and met with favorable reviews, and gained success. David M. Epstein reviewed the premiere in Musical America, stating that the piece is a "humorous affair done with a delightful, light touch. Barab has provided a tuneful setting, relatively simple harmonically, but handled with freshness. … With its small cast and charming writing, this should be a popular work with small companies." Barab came to be known for this simple and tuneful musical style in his compositions throughout his career. In 1957, Barab's second opera, A Game of Chance, with a libretto by E. Manacher, premiered in Rock Island, Illinois, and was also received well. 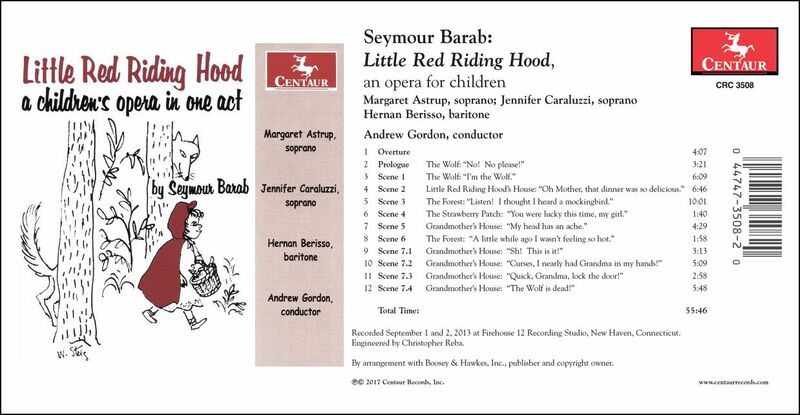 Barab's opera of the fairy tale Little Red Riding Hood (1962) is not only his most performed opera, but it is the most often performed opera by any American composer. It paved the way for more of Barab's fairy tale and children's operas for which he is best known. He composed the opera for a program called "Young Audiences" that toured around public schools. For the first time, Barab wrote the libretto himself, providing a prologue in which the singer, playing the part of the wolf, gets his makeup done on stage in front of the audience, allowing the children to see the transformation to reassure the children that the wolf is really just a man in costume. In his other fairy tale operas, Barab continued to cut or contextualize the violence, sometimes tweaking the story to emphasize the moral point. Barab’s proclivity for musical theater has made his operas consistently performed, especially his comic one-acts and those for young audiences. According to Central Opera Service, during the 1988-89 season, he was the most performed composer of opera in America. His fellow composer, Miriam Gideon, called him “the Rossini of our time.” His Little Red Riding Hood was the first American opera performed in China during the post-isolationist period. His highly praised full-length Civil War opera Philip Marshall, which uses Dostoyevsky’s The Idiot as a point of departure, was nominated for the Pulitzer Prize. 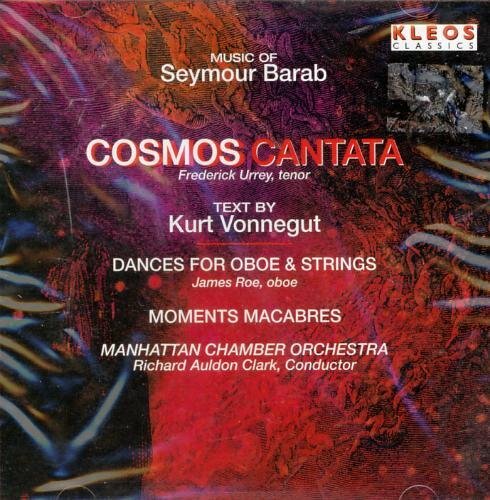 Barab’s Cosmos Cantata was set to a text by the novelist Kurt Vonnegut, and commissioned and performed by the Manhattan Chamber Orchestra under the direction of Richard Aldon Clark. Of their collaboration, Kurt Vonnegut said: “Barab’s music is full of magic. He proved to an atheist that God exists. What an honor to have worked with him.” Barab himself remained an athiest, but to those who knew him, his life and music proved that God exists. 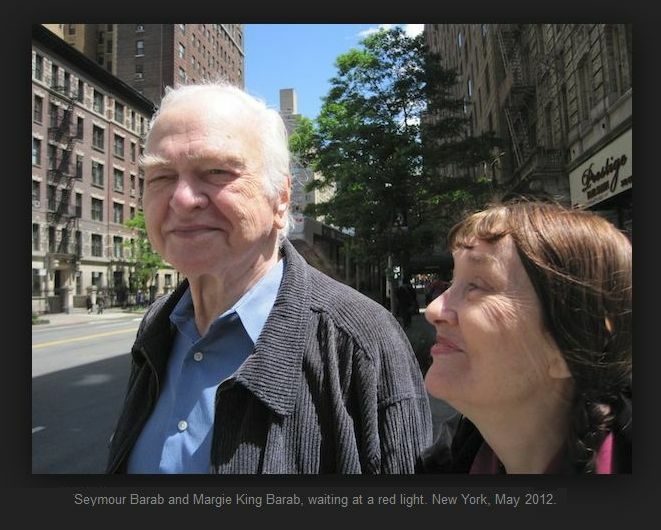 In 1971 Barab divorced Mary Ann, and in 1972, he was married a third time to Margie King. Together they had a daughter, Sarah. Barab continued to compose new works. His full-length opera Phillip Marshall was nominated for a Pulitzer Prize. Gerald Helund, in a review, commented that Barab's libretto is "packed with power, believability, and character with depth, animation and color. This Civil War 'mainstream modern' work belongs on the operatic agenda for 1976 with Ward's The Crucible and Floyd's Susannah. American Opera could have three no better representatives." Barab continued to be an active composer until his death at age 93 in Manhattan, New York City, composing operas, songs, instrumental works, and innovative narrated instrumental works. In 1998 he was presented with a Lifetime Achievement Award by the National Opera Association. In August of 1988, Barab agreed to let me phone him for a conversation. When he picked up the line, I was adjusting the recording equipment, and he remarked about the ease with which the electronics made this kind of interview. So, I picked up on his idea . . . . .
Bruce Duffie: Is music supposed to make life easier? Seymour Barab: Well, it is for the listener, isn’t it? I don’t know about the performer. Musical instruments are pretty hard. BD: Do you feel that you’re an anomaly — writing tonal music at the end of the twentieth century? SB: Well, of course, I do, and so does everybody else. But there are a lot of people who are doing it, and it may turn out that there will be — as we call it — a neo-tonal period. [Laughs] It seems to be gaining in popularity, and some of the important composers — I use the word ‘important’ in the sense that they’re in the news — are really very tonal, and sometimes even primitively tonal. BD: Is this pleasing to you that other composers are now returning to something that you never left? SB: I don’t have a long enough history as a composer, believe it or not, especially of instrumental music, to know about that, but I was extremely interested in atonal music as a performer. In fact, atonal music has dominated most of my life, but I was never interested in writing it myself from the time that I began interested in working music at all. It just didn’t interest me as a composer. It did interest me very much as a performer because it was extremely challenging, and some performers perform challenging music and still do. BD: I’d like to follow up a little bit on this somewhat schizophrenic idea. SB: What’s schizophrenic about it? BD: Wanting to perform one kind of music, and yet being unwilling to write that kind of music the for other performers. SB: Oh, I see. It wasn’t that I was unwilling. I should have liked to have written whatever was fashionable at the time, but I’ll tell you frankly that whatever attempt I made, I found was extremely boring. It just did not fall on musical instincts, but it called on extra-musical instincts. I’m interested in the problem of composers who really like their own music. I doubt very much whether a lot of composers of instrumental chamber music, orchestral music, non-vocal music, really like their music or get excited by it. One good question to ask composers is what composers they like. Very often I ask opera composers what composers they like, and it turns out that not only do they not like opera composers generally, but they don’t like opera generally. BD: Do you like operas by other composers? SB: I’m not a big opera fan, but I am a big vocal fan. I love the human voice. I like mysteries, and to me the human voice is the most mysterious thing in music — if not in the world — and I don’t think there’s any musical sound that quite equals the musical sound of the human voice. But what one hears in the world of opera is generally museum pieces, so I’m not a big fan of opera itself. BD: And yet that is the style you’ve chosen to compose in, mostly. SB: I found this peculiar talent in myself of being able to write words, which I never thought I had until I became middle-aged. But I do have some talent for writing words, thinking of plots, making dogged old rhymes which I call lyrics, and I’ve been accepted for doing that. My acceptance as an instrumental composer has yet to come, but I have been accepted as an opera composer. Of course, I like my own operas, which is very important to me. I like doing them, I like hearing them, and to see these things come to life on the stage is something that transcends by a few hundred miles, hearing a piece of abstract music. BD: So there’s never any thought to crafting some words for some other composer to set? SB: No, because they’re too hard to come by. It’s not the words that are hard to come by, it’s the ideas. Ideas come really pretty seldom. If I had people writing words for me, I could turn out operas at a furious rate, but it’s much more difficult for me — and much more involving, too — to write a libretto than it is to write music. Any composer should be able to write an opera, but they have a hard time finding librettos, and the reason is very simple. There are very, very few librettists. There are very, very, very few composers, for that that matter, when you consider that composers mostly have to something else for a living! So they are composers by accompaniment. But there are no librettists — except the ones that are in the commercial theater, and we don’t call them librettists, generally. One guy does the book, another guy does the lyrics, etc. BD: What advice do you have for someone who wants to be a librettist? SB: First of all, get a day-job! [Both laugh] Second of all, find a composer! The composer is easy enough to find. There are composers’ organizations. But I have had people send me librettos, and before I knew that I could do it myself, I was a pest. Anybody I’d ever heard of, or gotten to know, who had had anything published or was interested in poetry or anything like that, I would try to get a libretto from. Sometimes it worked, but mostly it didn’t. Now that my standards are so highly elevated by my own librettos, I don’t expect to find anybody else that’ll write a libretto for me. As for my writing for somebody else, I don’t think I could afford to do it. BD: When I ask composers about writing an opera, the big complaint is that they would never get it produced. But you’ve had all these operas produced! SB: Operas get produced. I think they would have the same attitude towards writing a symphony. I would have the same difficulty getting a symphony produced that any other composer would, except if it were commissioned. But it’s hard, and it’s hard even for me to get an opera produced. After all, there’s a capital outlay there. You could find a string quartet who is looking for material, although that’s pretty rare. But if you have friends, one of whom is a member of a member of a string quartet, you can get a string quartet done, and it doesn’t cost anything. It costs something to write the piece. People don’t appreciate the fact that being a composer is a pretty expensive business just in terms of cash outlay for paper, materials, and reproductions, making parts, etc. If you have a music copyist, it can be quite expensive even to write a string quartet. But most composers struggle along with their own copying. However, the string quartet itself doesn’t have to pay anything, except possibly a nominal fee for the use of the music. But they don’t have to worry about costumes, and the theater, and various other things that make producing an opera very expensive. BD: [Musing] You’ve never thought of having a string quartet being a kind of theatrical experience? SB: I haven’t. Other people have, but it still wouldn’t be a really theatrical experience. It would be what they call a ‘happening’. But that’s not my theater — to have four guys with instruments, three of whom would wander about the stage doing various things. Of course, the cellist is pretty well stuck to his endpin, and can’t do that sort of thing. SB: Oh, I’m sure you could figure something out! Then it would mostly have to do with lights and things like that, which are not the essence of theater. BD: Let me cut to the heart of the matter. We’ll stick with instrumental music first, and then go to the theatrical music. Where is the balance between an artistic achievement and then an entertainment value? SB: I don’t think there’s any difference. What does that do to the balance? I don’t know. I don’t think there’s really any difference. It’s simply entertainment and on a different level. We’re seeing purely entertainment works find their way into the purely artistic arena, which would be from, say, the Broadway theater to the Metropolitan Opera House. That happens, occasionally, with extraordinary pieces, like might be written by Leonard Bernstein, or Gian Carlo Menotti, or Steven Sondheim. The balance is sort of evening out a little bit. BD: Are you optimistic about the whole future of it? SB: The whole future of it is so involved with the future of the economy. After all, some works start out in the Broadway theaters, even some of Gian Carlo Menotti’s have. That’s okay, because you find private funding for that through angels. People expect to get a return on their investment, and they invest as they would in any other hopefully profitable thing. But for the opera, that’s purely a charitable organization. People invest less money, but they don’t really invest, they give money. They don’t hope to get any return, and one wonders where the money for this thing is going to come in the future. All money for artistic endeavors has already dropped off considerably, so the future of this artistic enterprise is very involved with the national economy. BD: Is there no way that you can convince more people that the return is not necessarily monetary? SB: I, personally??? Millions of dollars are being contributed, and I don’t think there’s any way that you could proselytize for having more money invested. In any case, I never knew how to do that. BD: Have all of the operas you have written come on commission, or are these things that you just wanted to write? SB: Mostly they’re things that I wanted to write. As I said, ideas are hard to come by, and if I come by an idea that thrills me, I get to it right away. I don’t care if there’s anybody waiting for it or not. Sometimes I’m lucky, and people want what I’m working on, and that’s the best situation of all. They wanted it without knowing that I was working on it. BD: Does it please you that so many people want to hear your works? SB: Oh, terrifically! Composers are really stand-up comics. They need an audience, and it doesn’t do to have drawers full of unplayed scores because you can get discouraged after a while. No, I feel that all composers should have their works played, and without any assessment of quality. My colleagues have always thought I was a little nuts on this subject, but I was always very sympathetic with composers who took the trouble to write it. It was my job, as an instrumentalist, to play it, and to encourage them. I did that even with people who’d become very celebrated. [Chuckles] I like to think I had a little hand in their coming to prominence. BD: Who is the ultimate judge of a piece of music — is it the composer, the performer, the audience? SB: I have to say the easy thing — history. SB: I suppose not one hundred per cent of the time, like anything else. But if you make value judgments, you’re doing it on an amateur level. The only people who are qualified to make professional judgments are professionals, and they don’t have an outlet. They don’t have a column in the daily paper, so it’s a matter of luck if the critics happen to like something. If the manager of the orchestra, or whoever, likes something, then that’s very lucky for the composer who’s written it. I know now, however, what’s happening today, of course. During the course of my professional career, I’ve seen so many different changes in the way music operates. All of these changes mystify me, but at least I can understand what’s happening. Why they’re happening I don’t know, but what’s happening today is there are consortiums of organizations that get together and commission a work from a particular composer. It’s less and less the individual organization — the chamber music organization, the symphony orchestra, or the opera company. They, who commission works, are usually now more a group of them. Then, who makes the decisions, I don’t know, and why they make the decisions, I certainly don’t know. I think it’s based mostly on the celebrity of the composer. The composer usually comes to prominence with just a couple of works, and then they’re given platforms on which they have future works, which is very, very nice. However, how these decisions are made, I don’t know, and furthermore, how a composer comes into prominence, I don’t know. I know of individual cases. Sometimes a work is newsworthy, but to me, being newsworthy is sort of extra-musical. It doesn’t really have anything to do with the music. People become newsworthy because they come with an idea that influences other people — which is okay, but it has nothing to do with their own particular talent for music. It may have more to do with their talent for other things, like public relations or getting into the paper. BD: Is there any composer that has the right balance of talent and propensity to get into the paper? SB: There are very few, and I wouldn’t care to name any names because that eliminates too many. But yes, there are people who are, what I call, super-talented. They simply have all the musical gifts. BD: I’m not looking for specific names, but there are these composers who can do this? SB: There are, yes. Generally, there are many more composers who are found in the concert field. The ones who are super-talented usually want to make a living doing what they doing, and they don’t have that opportunity in the concert world, so they go to the commercial world. You find the very-talented, super-talented people writing for the movies and TV, writing background music, and of course they’re subsidiary. They’re not the star of the show, as the composer of a symphony would be, but there are a lot of opportunities. BD: Yes, it’s very lucrative. BD: Have you made a living off of your music, or have you succumbed to the call of Hollywood and commercialism? SB: No, I never succumbed to that call. I had a shot at that. I have dome some film writing, like I have with everything, because, when you’re young, opportunities come your way. You know the people who need you, and I’ve always been interested in trying anything. I have written a couple of film things, and I’ve written for Broadway, and I’ve written for Off Broadway, and I enjoyed it all, but it’s not my idea of what I want to do with my time, so I never pursued any of that. The most lucrative of all for a composer is writing these little jingles for TV, and I also did some of that. The way you get paid is really kind of obscene for that sort of thing because it was just pure time and total lack of involvement. So I wasn’t too interested in that. I don’t make a living from writing, but I’m one of the very few composers who does make some money. Making a living depends on how much rent you pay, but I’m afraid I live in a high-rent district. Doesn’t everybody these days? BD: Even the low-rent district is much too high. SB: There is no low-rent district any more. That’s gone! It’s all out of reach. BD: Some of your works have been recorded. Are you pleased with the recordings that have been made of your music? SB: Yes, very! I’m so happy to have a recording at all. I want to tell you something about what’s happened. This is another one of those things that has gradually changed in the course of my professional career, and I’m speaking mostly for cellists now because that’s the way I’ve always made my living. There was a time when you wrote a piece of music, and you got someone to play it, and then you looked around for somebody to produce a record of it. There have been times when it was quite easy to do. I remember, especially, when long playing records first came around — sometime in late ’40s — and record producers, record companies, were looking for what they called ‘catalogues’. In other words, they needed products, and so it was fairly easy to get yourself recorded on one of these records, and the investment was small. Some of these record companies had their own studios, but gradually it got more and more expensive, and finally today, what’s happening is that it’s so terribly prohibitive that only big record companies and a handful of small ones are doing non-established works at all. On the other hand, because of the electronic instruments that are now being used so widely, for the people who play these it’s very cheap to make a recording. There are hundreds and hundreds of recordings that are being made by composers who do it in their own living rooms. They play the instrument which produces all the various sounds and tone colors they want, and the only real financial obligation they’re subjected to is getting these things pressed and distributed. BD: So they’re circumventing the studio musicians? SB: These are mostly keyboard players, or guitar players, and you don’t have to be a very good player to do this. With thirty-two tracks you can overlay the performances, one on top of the other, and what comes out sounds very complicated but actually, basically it’s very simple. You put down one note at a time just like you write one note at a time. BD: But is that ‘music’ when it is cut and paste? SB: Absolutely it’s music. Everything that uses notes is music. Punk or Rock is music. You may not like it, but it’s music nevertheless, and when the performers or the composers speak of ‘my music’, it is just like any other composer’s music. Yes, I think it’s music, but there are so many different kinds of music going today that it’s pretty complicated. You have to find out what music you care to listen to, just like the composer has to find out what music he cares to write. BD: Is there too much music now available on records? SB: Being a musician, I don’t think there can be too much music. The danger is that there’s going to be less and less as time goes on, because with all its abilities, electronic instruments are basically very limited, and I don’t think there’s any question that’s the future of music. One day we’ll have Societies for Forgotten Music, or Societies of Antique Music, and they will play Mozart quartets, and there’ll be a very special little audience who goes to hear them. BD: So you see the audience decreasing exponentially? SB: Well, yes, and there simply isn’t anything to look at. That’s why some conductors are so hot because you go to a symphony concert and the only thing to look at is the conductor. He better be worth watching! BD: Regardless of what he’s conducting? SB: [Laughs] Well, I never did think that the conductor was the important element in an orchestra. He’s only as good as the orchestra is, and generally orchestras are very good, and very loyal to my colleagues in the instrumental world. BD: You don’t feel that the conductor can bring out the best, or even a little better than the best, of any musician? SB: The greater conductor is the one who makes the fewest mistakes. I don’t think he adds anything really positive. Though people forget that when there’s an exciting performance going on, it’s not the conductor who’s making it exciting. It’s the music that’s making it exciting, and if the music is played with excitement, it can be an exciting experience. The trouble is that the conductor’s job is usually to force the instrumentalist to contain their excitement. BD: [Surprised] Not to find the excitement in the music? SB: No, because the orchestra does that all by itself! [Laughs] Of course, the conductor’s absolutely necessary, especially when you think of larger combinations like symphonies, and operas, and things like that. It just that I don’t think he’s the important part. BD: Do you want to go back to the days when it was the concert master giving the down beat, and that’s it? SB: I have played in conductor-less orchestras. There is at least one successful conductor-less orchestra in New York, and it certainly can be done. Their approach is simply uneconomic. The conductor can be a good time-efficiency expert. He could know what parts need working on for the orchestra’s sake. Unfortunately, most conductors rehearse what *they* need rehearsing on, which doesn’t help the music too much. [Both laugh] You going to get a lot of letters as a result of what I just said! BD: I would assume, though, that any orchestra needs that one set of ears out there, hearing what’s going on and almost being like a reporter. SB: Yes, but what about all the other sets of ears? What are they doing? Music is played by ear not by eyes. BD: I mean, one set of ears away from the group. SB: You mean one set of decisions? That’s what is time-consuming — making decisions. Do we go this fast, or this fast? Just how soft or loud should this be? Those are all decisions that a conductor makes, thereby saving time. BD: Couldn’t the ears just simply say, the players are accomplishing what they think, or it’s not working, and they need to do this to accomplish what they want? SB: No. Small chamber music combinations don’t do that, and a large group can play just as a small one does. They can tell the balance. That balance is in the score. Balance is not in the playing. You don’t think a good, professional orchestra would be playing as loud as they can all the time, do you? Professionals know how to play what’s on the page, and they know how to play with each other, and they know what’s going on in any particular moment that’s more important than what they’re doing. They listen to that. BD: Are they going to grasp that in a score they don’t know yet? SB: No, but whether a conductor is there or not makes no difference. It takes time to grasp that in a non-familiar score. Most scores that are played on symphony programs are very familiar to the orchestra, and they have to learn the occasional contemporary piece whether they have the conductor or not. The trouble is the conductor has to learn it too! BD: How do we get more contemporary music on the standard symphonic programs? SB: I lived in Paris for about a year, and I saw a real succès de scandale. This means that the whole audience gets up and roars its disapproval. One of the high points of my life was this specific thing that happened. It was a performance of Oedipus Rex by Stravinsky, which had been choreographed on the stage by Jean Cocteau. He had certain homosexual elements that caused the audience to become very furious. They all got up and started yelling, and waving fists, and things like that. That was a marvelous thing to see, because what we see today is that people just quietly get up and walk out. Now that’s one answer to your question [both laugh], but I don’t know how to get people into the concert hall when they’re so busy walking out. I don’t know if that’s the fault of the audience, or the composer. BD: Or, in this case, the director? SB: In this particular case, yes, it was the stage director, but that’s rare enough. But it seems to me that’s the sort of thing that should happen. People should stand up and boo if they don’t like a piece, and say, “Get that out of here!” But if they just simply get up and walk out, it’s like not voting. BD: You wouldn’t rather them stand up and cheer? SB: Sure. That’s great, and they do that often enough, too. BD: Thinking now about the theatrical works, let me ask another balance question. In an opera, where is the balance between the music and the drama? SB: In the case of the accepted works, pieces by Puccini and Verdi, etc., it’s definitely in the music. BD: Where is it in the case of the works by Barab? SB: Frankly I’m a little hesitant to say this because it’s so radical, but I think that in my own particular stuff, the words take precedence over the music. The music is fashioned to accompany the words. For example, I don’t feel that there has to be an orchestra. If you hear a piece by Puccini or Verdi with piano, it would sound to you like a rehearsal. My things are done a great deal of the time with piano because they’re done by small groups who simply can’t afford an orchestra. I like to feel that the fact that it’s being done with a piano does not make it sound like a rehearsal. The attention is on the stage. I’ve seen contemporary works where there was so much activity in the pit, and so little on the stage, that was perfectly obvious where the composer’s true identity lay. To me, it’s got to happen on the stage. BD: So you see to it the balance is on the stage and away from the pit or the piano? SB: I do my very best. Coming back to your question about balance between artistry and entertainment, I want it to be a show. I’m very heavily weighted for entertainment. BD: Let’s talk a little bit about some of your dramatic works. An Opera News survey shows three of your works in the ‘most popular’ category. SB: That’s one of the mysteries of music. I don’t understand that either; I’m just grateful for it. BD: I do not have the list in front of me, but one I know would be Chanticleer. SB: Chanticleer is a piece that I originally wrote for an adult audience, and it’s being done now a lot for children — which I don’t understand either, because it is really a satire on opera! It’s about a rooster who thinks he’s a great tenor, and it gets done quite a bit. There are a lot of organizations who do what they like to think of as ‘educational opera for children’ — that is something that children will sit through without having to go the bathroom a couple of times. So that, somehow, has found its way into that repertoire. BD: Is it ipso facto because you have written a number of works specifically designed for children? SB: Yes. That’s okay with me, but that’s not one of them. Chanticleer was done originally at Aspen, and Adele Addison did the soprano role. There are only four characters. That’s another thing which makes my operas easier to produce — they’re usually very small-scale. I like to think that I’ve written several things for adults that children would also like. I’m very pleased when I write a piece that children like because they’re so critical. Adult audiences are not critical. They’re the ones who just get up and quietly walk out. BD: [With a gentle nudge] Do they really get up and finally walk out, or do they just stay there and quietly fall asleep? SB: [Laughs] Well, there’s that, too! Those are even more reprehensible. There’s no excuse for staying there and falling asleep and being bored... although a lot of music today is being written specifically to induce sleep, or, if not sleep, at least trance! [Both laugh] But I don’t understand that. You have to have little masochistic streak to sit there for five hours hearing three chords. But I’m very pleased when children like my stuff because they’re very quick to say, in one way or another, that they don’t like. You hear a lot of talking. I used to go to the movies when I was a kid, and in all the love scenes the place would be abuzz with conversation until that part was over. But from everything I’ve heard, and from the number of performances those things get, I think that children like them... although it’s hard to know. Children don’t actually book operas. BD: If the Met handed you a commission, would you accept it? SB: The New York City Opera did hand me a commission, and I certainly did accept it. It turned out to be The Toy Shop. That was for their educational division. BD: But if they wanted something for the regular subscription series? SB: I certainly would jump at it, but it wouldn’t be for children on the regular subscription series. BD: So, you like writing for children? SB: I like writing for children because I find it’s very challenging. I know that I’m going to have to come up with something that they’re going to sit still for. I don’t have that feeling with adult opera — although I hope they sit still for that, too, but it doesn’t matter as much because they’ll be polite! BD: Since we’re talking about children, tell me about A Child’s Garden of Verses. SB: That was one of the works I was talking about before, that was needed by a record company who wanted to build up their catalogue. It was something I hadn’t even thought of doing. I was writing a lot of what they call art songs in those days, because my interest in the voice manifested itself very early. 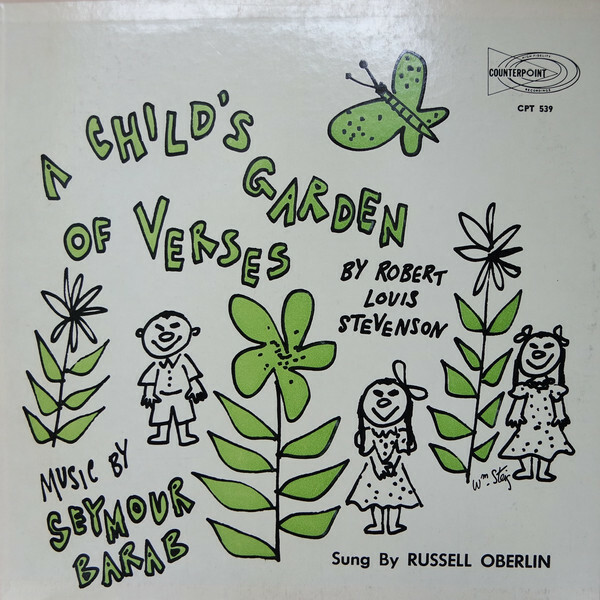 This record company got the idea of doing A Child’s Garden of Verses for voice and small instrumental combination. They approached me about it, and of course I grabbed it. Russell Oberlin was then the counter-tenor of the New York Pro Musica, and I was the viola da gamba player of the New York Pro Musica. So, I asked him if he would do it, and he said he’d be delighted, and we did it. It was very easy. We didn’t even have to go out to sell it; it was already sold. That was the way it happened in those days. Of course, a lot of things happened in those days because there wasn’t this plethora of music that there is today. For example, can I tell you what it was like to be a cellist, because that’s what I was. I wanted to get a job in a symphony orchestra. I was a young cellist, just out of high school, not a brilliant cellist because I started the cello very late in life — as I did everything else I’ve done, it seems. But nevertheless, I wanted the job. I wanted to be a cellist. There was an audition, and the conductor of Indianapolis Orchestra came to Chicago to hear the cellists that might be interested in the job at the Indianapolis Symphony Orchestra. There were two of us who auditioned for that job. SB: [Laughs] It makes the mind reel, doesn’t it? BD: Now at an audition for any position, there’s two hundred! SB: Exactly! Exactly what I was going to say. And not only are there two hundred, but you have to send tapes, then they screen the tapes, and you have to travel to the city where the job is at your own expense. It is absolutely incredible. BD: And I would assume that most of those two hundred could certainly fill the position. SB: I like to think that they can fill the position, but there are no positions to fill. When you have two hundred people, this is not really a competition, but actually something else. A competition means that you go down to five or six people you can’t tell apart. That is another one of the mysteries of why one person gets the job over another. This is something else I cannot understand. The way young people play today, the music schools are simply turning out virtuosos, and how one gets a job over another is very mysterious to me. It must be very discouraging to the participants because, like all competitions, there are always possible winners, and somebody makes up his mind that it should be this one, or some another one, and what are the reasons? They’re not musical reasons. BD: Are we turning out too many players? SB: Yes, absolutely. We’re turning out too many players for the number of jobs that there are. These people who want a career, or to make their living doing a particular thing, are never going to be able to do it, which is very sad. Take the situation that’s gone on in the theater for a long, long time. You can decide that you want to be an actor in college, and you get out there, and you either succeed or you don’t. But when you’re an instrumentalist, you have to make the decision when you’re about four or five years old. When you think of the career preparation that an instrumentalist makes — which is the most rigorous in the world — you can’t compare it to what it takes to be a doctor, a lawyer, a dentist, or a scientist. The idea that he’ll come away from all of this, having dedicated his entire childhood and youth to this proposition, and never being able to practice his craft is very sad. BD: Is there any upside to this — maybe keeping the level of those who do get in higher? SB: I don’t think it’s doing that because the level is so high, that with the current repertoire you can be vastly over-qualified. What does it matter if all these violinists come out being able to play the Tchaikovsky Concerto as well as anybody has ever played it? Then they get a job in which they have to play the second violin part of a Haydn symphony? BD: Then why is the Chicago Symphony so much better than the Indianapolis Symphony, which is so much better than the Des Moines Symphony? SB: Because all the instrumentalist from the Des Moines Symphony will try to get into Indianapolis, and from there will try to get into Chicago. The major symphony orchestras, first of all, pay more money, and somehow money is the root of all evil! They do pay more money, and that’s the more desirable job, with more benefits, perks, and prestige. So, it’s perfectly natural that people will want to ascend to the best orchestra they can possibly get into, but it gets harder and harder. BD: So, if all of a sudden several millionaires descended on the city of Des Moines, and decided they were going to have the world’s most outstanding orchestra, they could buy it? SB: Yes, in exactly the same way they bought the NBC Symphony Orchestra years ago, which was probably the best orchestra in existence at the time. They combed the entire world for what they considered the best musicians, and consequently put together the best orchestra. BD: With or without Toscanini? SB: With or without Toscanini, yes. As a matter of fact, relevant to our previous discussion, they did a memorial concert for Toscanini, which I attended, in which there was no conductor. The entire NBC Orchestra played a concert without a conductor. BD: Let’s come back to a couple more of your pieces. Tell me about the other old record with Barbara Cook, Songs of Perfect Propriety. SB: That was my idea, and I have Barbara Cook, who was the original Candide. Incidentally, the libretto of Candide was done by Lillian Hellman, and I thought she was spectacular. Here is something else that’s bringing the entertainment and art together. You find people such as Barbara Cook, who was then in musical comedy theater, and she was a real opera singer. I didn’t show the greatest moments with the voice, but everything else about her was absolutely operatic plus. She sang this thing, and I thought how marvelous she would be to sing something that I wrote. I thought the Dorothy Parker lyrics would be interesting for her, and it turned out to be the case. So, I approached one of my friends in the record industry, who is a producer, and he said, “Yeah, let’s do it!” That’s how it was in those days. It’s not particularly operatic for Barbara Cook, but then again, the lyrics were the important thing, and there’s something about opera that tends to subdue the meaning of the language. BD: This reminds me of something I wanted to ask about your operas. If they were done in, say, France or Germany, would you want them translated? SB: Well, they get translated whether the writer wanted to be or not! But of course, I want them to be translated. I don’t want to hear a contemporary American composer who writes an opera to write in some other language. I want to hear it in English. However, I don’t expect to hear Puccini and Verdi in English. In fact, I prefer not to. BD: But you’re so particular about the words. Do you find that the words should be translated, or would you rather have the words be correct, and maybe have supertitles in the theater? SB: That would be okay too, but failing that, I’d certainly want the audience to understand what’s going on. If they don’t have as witty and clever rhymes as I can produce, at least they’ll know what the story is about. As a matter of fact, I have had stuff translated for various places in Europe. One of my things was done in Chinese in China, and they made quite a production of one of my pieces in Brazil. So I’m delighted! BD: Let me ask about Alice a Cabaret. I’m a big fan of the book, Alice in Wonderland. SB: Oh, my God, it’s absolutely one of the most marvelous things ever produced by man. BD: Your piece is for narrator? SB: It’s for narrator. It’s not sung, and you don’t have to be able to read music, though there are some rhythmic things going on once in a while. I’ve done several things for narration. I like the idea of narrating instead of singing. After two hundred or so art songs, I’ve sort of lost interest in that. BD: [Surprised] Did you think the music would be inadequate, and you must have the words to supplement it? SB: What would Alice in Wonderland be about it if there were no narration? It was not some kind of ‘program music’ which the Alice suggested. I wanted to use those poems. BD: Another one on a record is Bits and Pieces. SB: That was written by commission from the Ariel Trio, who had a very strange group. I get lots of requests from strange groups for which there is no repertoire, and of course they need composers to write for their particular ensemble. But this was for piano, clarinet, and voice, so I wrote this piece to custom, so to speak. BD: Is there any combination that you would decline? SB: No! I’ve written from trombone ensemble, and my most recent piece has been for two cellos and the piano. I have also written for viola, cello, and piano, and for violin and viola. SB: I’m so gung-ho about challenges. If it seems difficult, I want to do it, and that would seem difficult. There’s one thing I remember I didn’t want to do, and that was for carillon. It’s a set of bells in one octave in the key of C, with only the white notes. So that’s a total of eight notes... at least that’s the way it was presented to me, and I really couldn’t come up with anything. 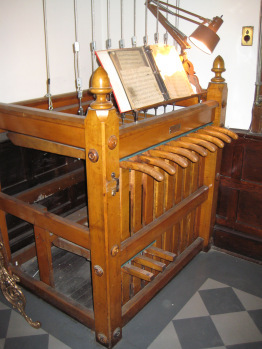 BD: Many carillons have upwards of forty or fifty bells, so this might have been a very small carillon in a church. SB: Yes, this was a church instrument. I just couldn’t think of how I could do anything without being totally repetitive. BD: When I was a teenager, I played the carillon at my church [shown in photo at left], and it had nine bells. SB: You could play this all by yourself? SB: There was a keyboard? BD: It had large levers that stuck out, and I had to mechanically push each lever down about eighteen inches. Each lever was attached to a chain, which was attached around a turnbuckle to the clapper of the bell. SB: It sounds like you couldn’t play very fast. BD: No, you wouldn’t want to play very fast, but you could play the hymn-tunes, and it worked out all right. 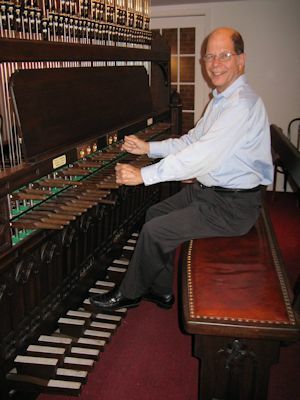 The University of Chicago has a carillon that has 72 bells with all of the accidentals and a keyboard [shown in photo at right] that has handles which are very small, and you whack them with your fist. SB: And does one person play this? BD: Yes. It’s not a case of pulling a free swinging bell, like you see in the cartoons. SB: Oh, I know, but why couldn’t you have two people playing if you had that many bells, and have some harmony? BD: I suppose you could, but because of the expanse of sound, it would get blurred together. SB: Yes, right, I can see that. That would be complicated because a bell tones don’t stop once they’re started. BD: Right, there are no dampers at all. [Coming back to the topic] Tell me about the Duo No. 2 for Viola and Piano, which is on the LP. SB: Emmanuel Vardi was always a preeminent violist. He’s still around and still very active, and he had a big reputation at one time. He was probably one of the very few violists, like William Primrose, who made the viola a virtuoso instrument, and he made a recording, which is quite spectacular, of the Paganini Violin Caprices. SB: On the viola. That’s the sort of thing he would do. I’ve heard him do some of those in public, and he’s really pretty wonderful. He’s playing as well as ever. BD: Obviously, you’ve written a Duo No. 1 if this is Duo No. 2. SB: Yes, I’ve written at least three because violists don’t have a lot of repertoire. That’s another case where they have to go to a composer. That’s one of the reasons, and the other is that they have the feeling that if they do a premiere, the critics will come to the concert, because now there are so many concerts going on in New York that critics simply can’t cover them. There are more concerts, but there are fewer reviewers. BD: If the commission is for a full-blown concerto for viola, are they expecting another Harold in Italy? SB: [Laughs] I have written a piece for viola and string orchestra, and I don’t think they expected that. Mostly what they expect is something the audience will stay for, and that the critics will applaud — or at least applaud the performance, if not the piece! BD: It sounds like the composer’s getting short shrift on this. SB: Well, the composer does, but there are just too many composers, like there are too many instrumentalists, to all get jobs. There are too many composers for them all to get a decent shot. Another upshot of that is that they don’t get many performances of the same piece because people always want to play a new piece. History, no doubt, will sort it out. BD: Many composers find it’s harder to get that second performance. Do you find that also? SB: I haven’t had any trouble with second performances. Generally, I’ve gotten those and maybe the third, but beyond that it’s questionable. It’s like what happens with these consortiums that combine to commission a piece. Every one of the members of that consortium performs the piece, and then whether it ever gets performed again is doubtful. But at least it’s nice for the composer to have three or four performances. BD: True. Tell me about the Saxophone Quartet. SB: The Saxophone Quartet was a commission from this group who were looking for saxophone material. There really isn’t much else to say except that I hope that it’s noticeable there’s certain rhythmic, melodic, and harmonic disparities because, although I do write very tonal music, I don’t want it to sound like Mozart. So the elements of the music — melody, harmony, rhythm — don’t quite synchronize, and I hope that is what keeps it from sounding truly classical. BD: And yet it will be completely accessible? SB: Yes, because all the disparate elements are accessible. They’re simple tunes, simple harmonies, and simple rhythms, but they just don’t happen where they’re supposed to. I don’t like explaining. It’s like explaining a joke! [Both laugh] If you don’t get it, then nothing is going to help. BD: You want the music to speak for itself? SB: [Hesitates] I wouldn’t use the word ‘fun’. When you sit down to a desk with a paper and pencil at six o’clock in the evening, and the next thing you know the sun is coming up and it’s dawn, what do you call that? It’s not ‘fun’. BD: [Interrupting] Are you totally out of it, or totally into it? BD: You should invent a new word, like you invent a new bit of music! SB: Yes, and I can think of several examples where new words are needed. [Musing] Some languages probably have too many words for that. BD: Exactly. It’s been a great pleasure speaking with you this afternoon. SB: Oh, I can’t believe that an hour has gone by! Is that really true? BD: There you are, you see, you’ve totally been into it! SB: Yes, this is an example. [Laughs] I do thank you. I’ve enjoyed it so much. I’m very flattered that you called me. This conversation was recorded on the telephone on August 21, 1988. Portions were broadcast on WNIB in 1991 and 1996. This transcription was made in 2018, and posted on this website at that time. My thanks to British soprano Una Barry for her help in preparing this website presentation.